Risk analysis is the final goal of all approaches dedicated to natural hazards. Eventually have to know where dangerous processes can occur (Fig. 1), what their magnitudes are and how objects and people submitted to potential natural hazards can be affected. The cots-benefit analysis (Fig. 2) is implicit for most risk analysis. The study of natural hazards must be optimized as well as countermeasures designed to limit risks. One of the main points is the information to the public. Better-informed and better people educated can live more easily under risk than people not educated in natural risk matter. This assertion is especially true regarding evacuation or appropriate behavior in case of earthquakes. More important is the respect of the state of the art in construction of new buildings and infrastructures in areas submitted to specific hazard (floods, rockfall, debris-flow, earthquakes, etc. ), this can be carried out only if each level of a society takes into account natural hazards. Fig. 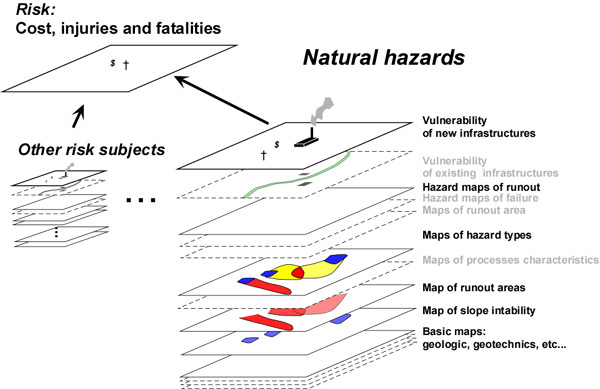 1: Classification of elements participating to natural risk linked to landslides for landslides (modified after Jaboyedoff et al., 1999). 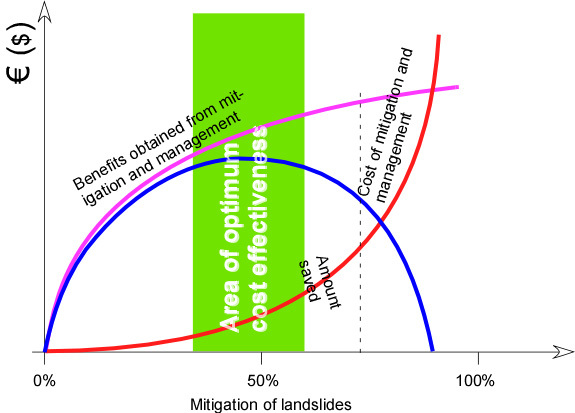 The global approach of natural risk management must lead to acceptable costs. This point must never be forgotten for scientists and engineers in the design of methodology and design of countermeasures. Fig. 3: Different level of knowledge that must be clearly identified for a risk analysis. The use of GIS is recommended (modified after Jaboyedoff et al., 1999). Their dimension is a frequency. It varies from 0% (no loss) to 100% (total loss). Potential loss caused by an event with a given intensity. It is expressed either in terms of number of exposed units, or in financial terms. Canuti, P., and N. Casagli, Considerazioni sulla valutazione del rischio di frana, fenopmeni franosi e centri abitati, Atti del congresso di Bologna del 27 maggio 1994. Pubblicazione n°846, 1994. CFGI (Comité Français de Géologie de l’Ingénieur), Caractérisation et cartographie de l’aléa dû aux mouvements de terrain. Collection “Environnement – Les risques naturels”, pp. 91, Laboratoire Central des Ponts et Chaussées, 2000. Cruden, D. M., and D. J. Varnes, Landslide types and processes, in A. K. Turner and R. L. Schuster, Landslides, Investigation and Mitigation, vol. Special Report 247, edited by, pp. 36-75, National Academy Press, Washington, D.C., 1996. 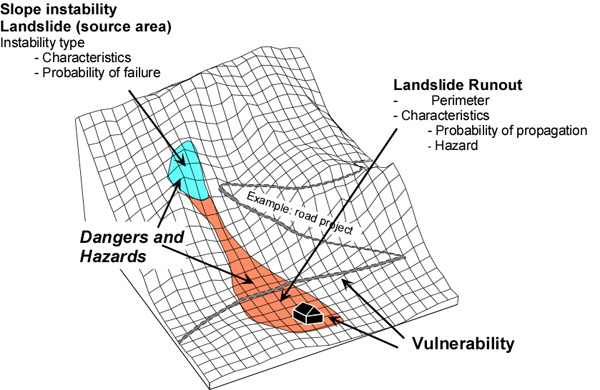 Einstein, H. H., Landslide risk – Systematic approaches to assessment management, in D. M. Cruden and R. F. Fell, Landslide assessement, pp. 25-50, A.A. Balkema, Roterdam, 1997. IDNDR, Glossary: international agreed glossary of basics terms related to Disaster Management, pp. 83, DHA-Geneva, 1992. Jaboyedoff M., Baillifard F., Hantz, D., Heindenreich, B. et Mazzocolla D.:Terminologie. In, Prévention des mouvements de versants et des instabilités de falaises. Confrontation des méthodes d’étude des éboulements dans l’arc alpin. Programme Interreg IIC – « Falaises ». Méditerranée occidentale et Alpes latines. 48-57. In Confrontation des méthodes d’étude des éboulements dans l’arc alpin. Programme Interreg IIC – « Falaises ». Méditerranée occidentale et Alpes latines. 70-83. 2001. Nebel, B.J. and Wright, R.T., Environmental Science. Fifth ed. Prentice Hall. 698 p. 1996. PPR, Plans de Prévention des Risques naturels, risques de mouvements de terrain. Guide méthodologique, pp. 71, Ministère de l’aménagement du territoire et de l’environnement, ministère de l’équipement, du logement et des transports. La documentation française, 1999. UNESCO, A suggested method for reporting a landslide. The International Geotechnical Societies’ UNESCO Working Party on World Landslide Inventory, Bulletin de l’Association Internationale de Géologie de l’Ingénieur, 41, 5-12, 1990.